[James West] has a young Doctor Who fan in the house and wanted to build something that could be played with without worrying about it being bumped and scratched. So, instead of creating a replica, [James] built a simple remote controlled K9 toy for his young fan. K9 was a companion of the fourth Doctor (played by Tom Baker) in the classic Doctor Who series. He also appeared in several spin-offs. A robotic dog with the infinite knowledge of the TARDIS at hand, as well as a laser, K9 became a favorite among Who fans, especially younger children. [James] wanted his version of K9 to be able to be controlled by a remote control and be able to play sounds from the TV show. Using some hand-cut acrylic, [James] built K9’s body, then started on plans for the motion control and brains. [James] selected the Raspberry Pi Zero for the controller board, a Speaker pHat for the audio, a couple of motors to move K9 around, and a motor controller. K9 is controlled by a WiiMote and has a button on his back to start pairing with the WiiMote (K9 answers with “Affirmative” when the pairing is successful.) When it came to the head, [James] was a little overwhelmed by trying to make the head in acrylic, so he got some foam board and used that instead. A red LED in the head lights up through translucent red acrylic. It’s a great little project and [James] has put the Python code up on Github for anyone interested. We’ve had a couple of robot dog projects on the site over the years, like this one and this one. There’s the R2 Builders Club, hundreds of people are building BB-8, but there are a few robots that don’t get enough love from the amateur propsmiths. [Kenneth] just finished up his build of Crow from MST3K. He built Tom Servo a year or so ago and K-9 from Doctor Who. The beautiful thing about building MST3K robots and Doctor Who props is that you’re probably working with a larger budget than the prop department had. Heathkit’s new website is up. The two products we know about so far – an AM radio kit and a slim jim antenna – can only be described as, ‘meh.’ Still, there are a few upgrades for old kits available and the requisite amount of nostalgia. On today’s issue of, ‘should not be attempted by anyone, ever, under any circumstance’ here’s how to build a table saw at home. Yes, it’s a table saw built from a piece of aluminum, styrofoam, hot glue, and a shoe box. The guy really botched it by not going for the zero clearance insert here, but at least the fence is only a few dozen degrees off parallel with the blade. [Mathieu] is working on a Mooltipass Mini. It’s tiny and the scroll wheel thingy makes things fun. March 18th through March 20th is the Midwest RepRap Festival in Goshen, Indiana. This is, by far, the best conference, meetup, or festival we go to year after year. We’ll have a few members of the Hackaday crew at the event, and rumor has it the Internet has made it to Indiana this year. Adafruit got a writeup in the New Yorker. The article is technically about the art of PCB design, but as with most general interest pieces on electronics it is awash in non sequiturs and simply defining the terminology. [Oscar] built a miniature replica of a blinkenlight computer last year for the Hackaday Prize. This was the PiDP-8/I. While it looks awesome, the PDP-8/I is inherently limited. [Oscar] has his design methodology down, and now he’s working on a miniature replica of the king of the PDPs. It’s the PiDP-11/27. It’s just a prototype and render now, but the finished project will have custom switches, a handsome bezel, and will be much more capable. MAME is now FOSS. That’s great news, but think about the amount of work that went into making this happen. MAME is 19 years old, and that means everyone who has contributed to the project over the years needed to sign off on this initiative. Convention-goers have likely strolled past a number of Daleks: the aliens drive around the event space, spouting threats of extermination and occasionally slapping folks with a rotating eyestalk. 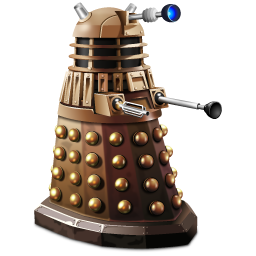 [James Bruton] has been hard at work building this Wii-remote-controlled Dalek with his fellow hackers at the SoMakeIt Hackerspace (you may remember our write-up from earlier this year). Most Dalek builds seat a driver inside the body at the helm of a salvaged electric wheelchair, where they plunk around using a joystick control and simmer in an increasingly potent aroma. This version started like most, with a wooden structure from plans sourced at Project Dalek. Inside, however, [James] and his crew have tapped into the wheelchair’s motor controller to feed it a PWM signal from an Arduino Shrimp, which is linked to a Raspi. The Pi receives a Bluetooth signal from a Wiimote, and, through their custom Python script, directs the Dalek with ease. They’re still working on finishing the Dalek’s body, but they’re using some clever tactics to push onward: using a 3D-printer to solve some of the nuanced styling choices. They’ve uploaded a gallery with additional photos on Facebook, and you can watch them goofing around with their creation (losing their balance and nearly exterminating themselves) in a video after the break.